Dr. Alan R. Rissolo and staff deliver high quality Oral and Maxillofacial Surgery care with a gentle hometown style. 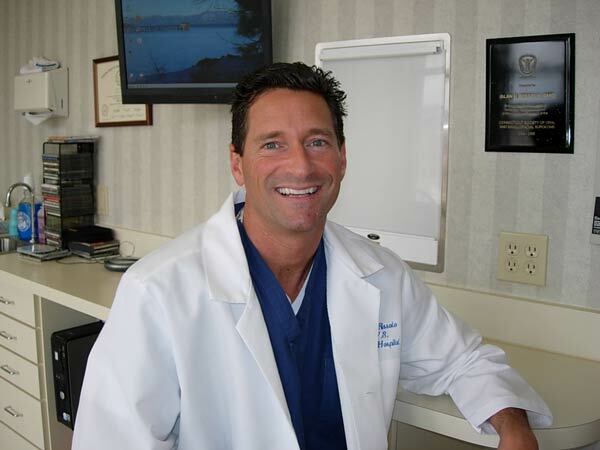 A Native of Norwalk CT, Dr. Rissolo graduated Fairfield College Preparatory School and Boston College before he received his doctorate degree from the University of Connecticut School of Dental Medicine in 1987. Following Dental School he pursued his special interest in Implant Dentistry with internship training at the UCLA Health Sciences Center. ( PGY1) He then returned to UCONN for his residency in Oral and Maxillofacial Surgery. ( PGY 2 – 5 ) He again returned to UCLA to complete additional externship training at the UCLA Maxillofacial Implant Center before entering his Norwalk private practice in 1993. Dr. Rissolo is on active staff at Norwalk Hospital since 1993. He is a member of the Surgical Executive Committee, Section Chief of Dentistry, Past President and board member of both the Connecticut Society of Oral and Maxillofacial Surgeons and Greater Norwalk Dental Society. Three times certified by the American Board of Oral and Maxillofacial Surgery since 1993. A member of the International Team for Implantology, he has published articles, served on implant consulting committees and lectures on various dental implant topics including Bone Grafting, Immediate Dental Implants and Computer Guided Surgery with Immediate restorations. In Norwalk CT his private practice office offers comprehensive Oral and Maxillofacial surgical care with a special focus on Advanced Dental Implant Surgery, Minimally Invasive Wisdom Tooth removal and care Facial Injuries. All surgery is delivered in a gentle caring atmosphere with the cooperation of a highly trained staff using the latest research documented technologic advances. In his free time you are likely to find Dr. Rissolo on the tennis court, skiing, waterskiing or just laid back playing his guitar enjoying friends and family. Dental School: University of Connecticut Residency Training: University of Connecticut, University of California at Los Angeles.